One of the most popular Kdramas in South Korea this year (2015) is Yong Pal. I had been waiting in anticipation to see it because Joo Won and Kim Tae-Hee, both of whom are on my favorite actors and actresses lists, are the stars. It just had to be good. Let me rephrase that… it should have been good, it should have been great. But in all reality… not so much. Kim Tae-Hyun is in his third year of residency at Han Shin Hospital. He’s a good doctor and a kind man but he has, unfortunately, gotten himself deep in debt to the kind of people you don’t want to owe money to. He borrowed quite a large amount from a loan shark so he could pay for his younger sister’s dialysis treatments. So how does a financially struggling doctor pay back that kind of loan? Well, he works it off a little at a time by treating gangsters who would be arrested if they showed up at a hospital with gun shot and knife wounds. He goes to them wherever they may be, referring to what he does as “house calls”. One particular policeman is determined to find the man who is blocking the path to his arrests, since criminals can’t be caught when they never surface at a hospital to have their wounds treated. Doctor Lee, who also works at Han Shin Hospital, finds out about Tae-Hyun’s “house calls” and blackmails him into working on a special floor of the hospital. Because of his loan shark debt and ill sister’s expensive treatments Tae-Hyun will do whatever he’s told to do. He becomes the guard of a beautiful, young, comatose woman named Han Yeo-Jin. She is the heir to a huge company and her evil, greedy half-brother, Han Do-Joon, wants it all. As her legal guardian he has ordered she be given drugs that will keep her sleeping indefinitely, and he pays handsomely to make sure his wishes are carried out. But what happens when Do-Joon decides after three years it’s time to get rid of Yeo-Jin for good? Kim Tae-Hyun, who calls himself Yong Pal when he’s making his “house calls”, is a very skilled doctor who hasn’t yet decided what field of medicine he wants to specialize in. He defiantly prefers working in the hospital over going to dirty warehouses to stitch up criminals, but he is thankful he has that particular opportunity since it allows him to pay back his loan faster than his third year resident salary would. He dearly loves his little sister and gladly puts his life on the line for her. He has a sympathetic heart and always tries to do the best he can for others. He loves deeply and unconditionally. I thought he was a bit too understanding when it came to the woman he loved but it made the show more “romantic”, I guess. Han Yeo-Jin starts out as a wimpy woman full of self-pity and quickly grows into a vengeful, soulless $&@%#. Having had three years of her life stolen by her very own brother, she has hate in her heart and wants revenge on everyone that had anything thing to do with her comatose prison. But how far is she willing to go to get that revenge? Will she give up the only good thing in her life in order to feel justice has been served? Han Do-Joon is Yeo-Jin’s handsome, greedy older half-brother. They were close as children but drifted apart when Do-Joon came to the correct conclusion that their father loved Yeo-Jin more than him. He is hungry for power, status, and wealth and will do anything to insure he gets them. He loves his wife but realizes she has never loved him. Lee Chae-Young is Han Do-Joon’s wife. She loves power and money and married Do-Joon simply because he could give her just that. We’re able to see she has a kind, vulnerable side but it’s not as strong as her selfishness. The woman is definitely a user. I think Yong Pal‘s success comes from its stars – Joo Won and Kim Tae-Hee. They’re why I watched it. In my opinion, Joo Won is one of the most talented entertainers in South Korea right now. He began his career in musical theater in 2007, but didn’t appear on the small screen until 2010. He has been in six musicals, seven feature films, and seven dramas, has sung on the soundtrack of five of the dramas he’s been in, has won a total of 14 awards, and is nominated for the Grand Prize award for his performance in this drama. Is there anything the guy can’t do? Oh yes… he also plays the guitar. If you haven’t already seen him in Good Doctor, do yourself a favor and start it soon. It’s definitely his best to date – a truly amazing performance. Thirty-five year old Kim Tae-Hee began her career as a model in 2000. She has been in a handful of feature films and 12 dramas and has earned 14 awards. Sadly, I wasn’t thrilled with her role in Yong Pal. Her acting is fine, it was just the character I disliked. A bit of juicy, romantic info… she is currently dating the singer/actor Rain. His performance in My Lovable Girl is sheer perfection! Quick, someone write a romantic Kdrama and let’s have Tae-Hee and Rain star in it. If you happen to think the inner workings of the human body is icky, prepare yourself for this drama. The show is quite detailed where medical things are concerned. I was really impressed. They show needles going into people’s arms, staples closing a knife wound, a c-section birth, intestines, a liver being removed, lots of cuts, and blood, of course. I have no idea if those things were real or not (you know, shots from some sort of medical documentary or something like that) but if it was all fake someone on that show deserves an award for making it all appear so authentic. But let’s get a little original here, Kdrama writers. How many times are we going to see on the screen what a doctor can picture in his mind is wrong with a patient? The first time I saw that idea was in Good Doctor. I thought it was really cool and a wonderfully original idea. Then I watched Doctor Stranger and the exact same idea was incorporated into that show. And now we can add another drama to that copycat list, Yong Pal. It only happened a few times but that was a few times too many. How about some new ideas?… please. If they cut out all the remembering parts in this drama, the show would probably loose about half an episode. No kidding. I lost count how many times we’re shown the car accident Yeo-Jin and her boyfriend were in. Over and over, the same exact thing. It gets monotonous after the second time. And they do it for other “memories” as well. Kind of makes me wonder if the writer didn’t always have enough content so the director just put in “filler” of what they already had. In my opinion, Yong Pal didn’t need to be 18 episodes long. I think the show would have been much better if it had ended about 20 minutes into the 13th episode. The original plans were to have it be 16 episodes but because of the good ratings – 23.7% at its highest – they decided to stretch it out to18, two more hours. The extra time certainly didn’t ruin it, by any means, but what came after the 13th episode was totally unnecessary, in my book. The soundtrack is alright. The song entitled Nightmare, performed by Yong Jon-Hyung (from Beast) and Heo Ga-Yoon (from 4Minute) is quite good. Jon-Hyung raps the verses while Ga-Yoon sings the chorus. A pretty song called Angel is sung by Westlife, an Irish boy band. Sadly, I wasn’t thrilled with the song entitle The One. The problem I had with it wasn’t the song itself but the singer’s voice. I have no idea who the artist is but his voice is rough, scratchy, and irritating. Not what a love song voice should sound like. If you want vocal cords worthy of crooning a love song you get Kyuhyun or Yesung from Super Junior to sing it. I quite enjoyed the scenery in Yong Pal. There’s a lovely stream and a place they call Windy Hill that is just beautiful – green rolling hills with tall, white windmills all around. 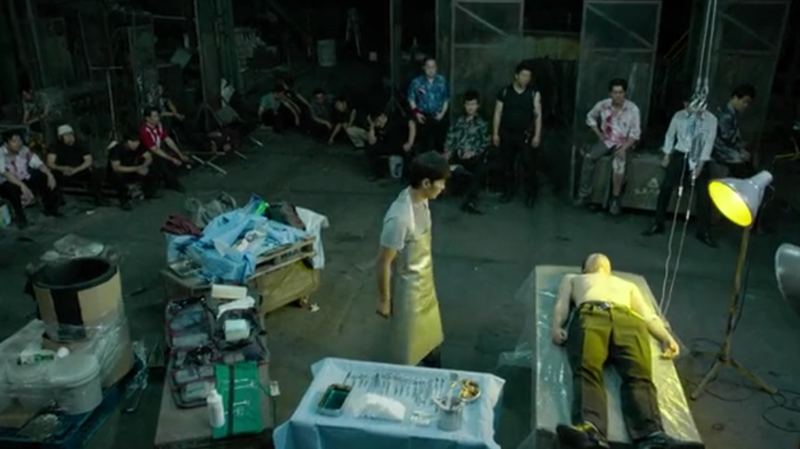 It’s a wonderful contrast from the dark and dirty places where Yong Pal goes to help out the gangsters that are in need of medical treatment. Those spots look exactly like where you’d imagine “bad guys” would be hiding. The hospital room Yeo-Jin is kept prisoner in is really cool – the doctors read the medical information off glass walls that surround her bed. That was probably on a sound stage, but still… This drama definitely gets points for scenery. Yong Pal is pretty much a middle-of-the-road show. It’s definitely not among my favorite shows aired this year – Kill Me, Heal Me; Sensory Couple; Healer; Hyde, Jekyll, Me (to name just a few) are all much better – but it wasn’t among my least favorites, either. Oh, just in case you were wondering, Yong Pal means “skilled quack”.